About – THE BOOKS THAT TIME FORGOT. Well hello and welcome to my blog. I am basically a guy who works in a cubicle as an account for a Japanese company that makes scales. As you have guess it is pretty boring. I am a writer and have written a screenplay and hope to write more. So this blog is basically something to help with my writing. I read that writing reviews helped with writers block so I’ll review books that I have been reading. 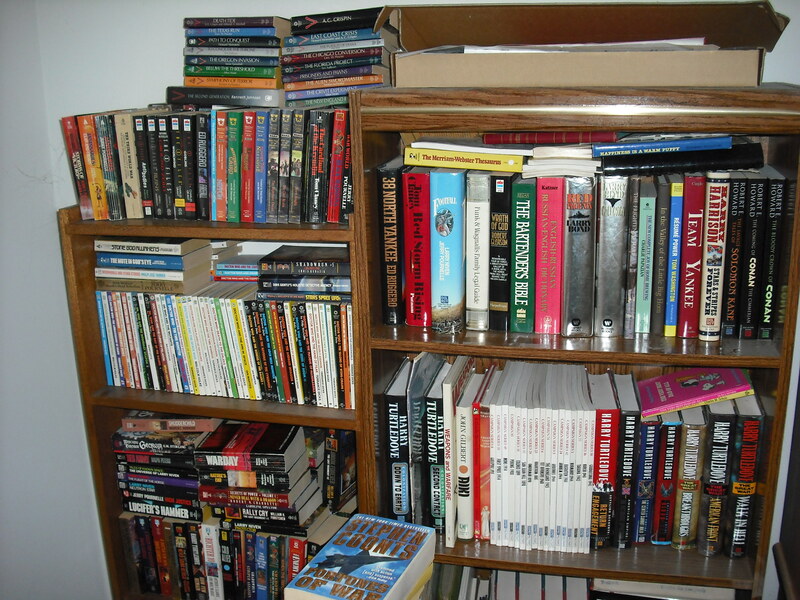 My library is filled with old books from Zebra’s Men’s Adventure, Pinnacle, Dell, and Gold Eagle. The old pulps of the 80’s. Also Edgar Rice Burroughs, Science fiction and military adventure. In a lot of ways time has passed by these books. So sit back and enjoy a nostalgic visit to the past. Thanks for following me. I think you’ve got a great idea reviewing old books. Thanks for following my blog. Ha–your bookshelf looks like mine, with books crammed in horizontally over the vertically stacked ones. I see you have some Conan on your shelves. I remember reading a long series of Conan books when I was a kid, but I can’t remember any details. I’d love to read your opinions on them. I loved reading Conan comics as a kid. While rereading these comics I noticed a few years back that they were releasing collections of Robert E. Howard. I absolutely love his writing. Howard had a very poetic style and weird imagination. I hope to read more of his work in the future. Thanks for following my blog. I have a review of Edgar Rice Burrough’s John Carter series in development, which I will compare to the unfortunate Disney movie. You have inspired me to finish it already. (I have a habit of having several drafts going on at the same time). Since we are both ERB fans, what is it about his writing that you like? He is the author that I credit for my love of reading. I just enjoy the strange world and creatures that he created. It really enjoyed the straightforward adventure. I will probably get around to reviewing the John Carter books so I look forward to reading your take on the book. I totally agree with your description: straightforward adventure. Many thanks for the follow! I love the purpose of your blog and the works you’re covering. Looking forward to reading more from you. What a great idea for a blog! Well done! Thanks, too, for your decision to follow Learning from Dogs. What a great concept! You could review my book (Trees in the Pavement) which is six years old this year and time probably never even got around to remembering it to begin with. 😉 But even if you don’t, I’ll still read the reviews of the other stuff. Heh. I love seeing all those Dr. Who paperbacks on your bookshelf! Thank you for the follow. Good to see a classics fan. The quick John Carter update brought me back to the younger days (of which too much had been forgotten). Thanks for the follow, and back at you. Looking forward to future posts. I, too, think you have a great idea reviewing older books! Thank you for coming by my blog and for the follow! Thank you so very much for taking a trip on over to my blog and following it! What you’re doing here is very interesting. I’ve been meaning to jump back into literature from years past, I just didn’t quite know where to start. I really look forward to reading more of your reviews. And, thanks again for the follow! Sorry, my phone and I don’t always get along. I was saying that I was looking at your pile of books and I think I have some of them on my shelves. Anyway thanks for the follow! It sounds like an interesting life, not a boring one. 🙂 Your blog is certainly interesting. Hi MC- Thank you for following my photography blog, Jane’s Lens. I hope you are inspired. Great idea to do reviews and I look forward to reading more. Thanks for following my blog. I am a fairly new writer, with only one book out, but hope to get more out in the future. Hey thanks for the follow….interesting blog, you have here! Hello and thanks for visiting the Dream Well, I hope you found it helpful or at least interesting.. I love the idea of this blog, and am a bit of a fan of certain old sci-fi myself. Have you ever read “Fish Dinner in Memison” by ER Edison? Not exactly sci-fi but a bit of a precursor. And may I humbly suggest R A Lafferty’s “Fourth Mansions” for something a little different… All the best and dream well! Hello! Thanks for following my blog. It’s much appreciated. My husband is into the 80’s stuff. He can tell you more things about the era than myself lol. Wow, so you’ve written a script. I have some unfinished scripts, hopefully, I’ll finish them soon, but for now, I’ll work first on getting one of my novels published. Stick with the novel. More people will read it. Thank you for liking my poetry in my little blog Fires In Ashbarrels. Long time ago I figured out the best way to beat writer’s block was to switch up and write something else, like movie reviews while my subconscious worked out story details in the background. 500+ movie reviews later and writer’s block has never bothered me. I see you’ve worked out your own systems for dealing with it. I look forward to reading your book reviews. Hey, just wanted to say thanks for following me. Your selection of books looks pretty cool … I love those Ballantine Tarzans! 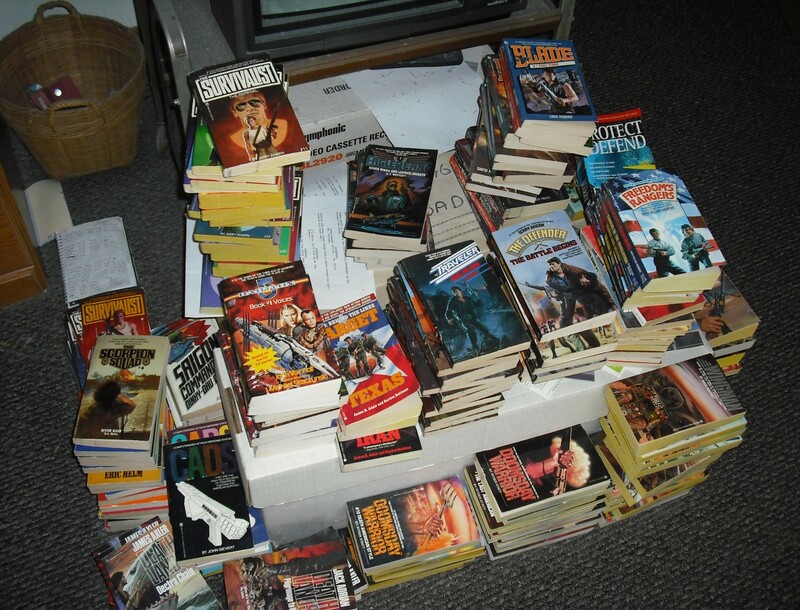 I also read quite a few “pulpy” paperbacks in the 80s (though not as many as you, apparently). When I find some time, I’ll probably make my way through your archives and see what you think of some of my favourites; I notice you’ve got Vietnam Ground Zero on your list … that was a cool series. Have you read Phoenix Force? I always loved those. Never read Phoenix force but someday I would like to. I was mostly into the post-apocalypse series at the time.